DO-IT-ALL is a clear sealer with added fungicide that seals the slab, preventing water absorption, and hence discouraging the growth of Algae, and preventing dirt penetration. 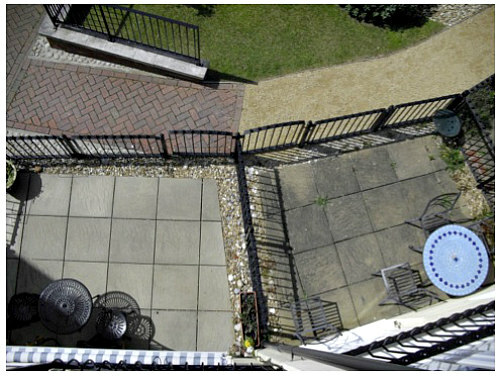 The patio on the left was cleaned and treated with DO-IT-ALL in 2011, and has remained in a clean condition. CLEANING: After a warm soggy winter, we have had almost perfect conditions for algae to grow on patios, driveways, garden paths, and other garden masonry. Using Eco-Chem Patio and Paving Cleaner for heavily soiled surfaces, or Eco-Chem Multi-Surface Algae Remover where algae is the only problem, surfaces can be easily cleaner ready to seal. SEALING: By sealing the surface, further water ingress can be prevented, and hence deny any future Moss or Algal growth of sustenance. DO-IT-ALL is a tough acrylic based clear sealer with added fungicide, which, depending on the rate of application can be barely detectable to the naked eye or if applied at a higher concentration can enhance the appearance of natural stone. AQUA-STOP is an excellent product for waterproofing ponds constructed from bricks, stone, mortar, concrete or other masonry products that are sound and absorbent. AQUA-STOP has been used successfully on both small and large ponds, in gardens, and trout farms. AQUA-STOP is easy to use, and is best applied by brush as a slurry, onto the pre-wetted masonry surface. Once applied, the product should not be allowed to fully dry out for 3 days, to allow the “crystallisation” process to take place. AQUA-STOP is fish friendly, and easy to apply.